Henry Harbison is in many respects a mystery. I suspect we're related, but I have no direct proof of it. I suspect he was a scion of the Ballyneill Harbisons, but I have only circumstantial evidence for that. And yet he's the lynchpin of everything I know about the Catholic Harbisons in America. There are no Irish records at all. 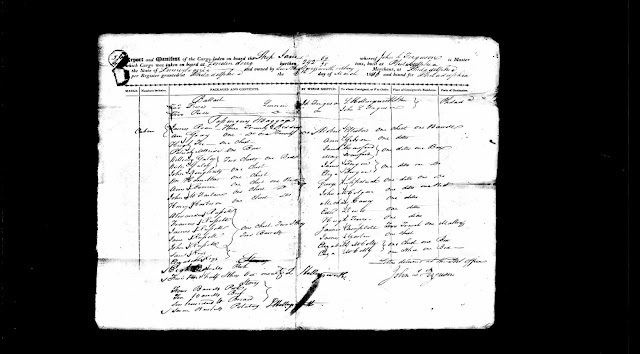 The first record of Henry is his emigration from Ireland, on the ship Jane, from the port of Derry, which arrived in Philadelphia on June 14 1816. Above is the cargo manifest. His possessions fit in one chest. Since he left from Derry, he was probably part of the Derry/Tyrone branch; an Antrim or Down Harbison would most likely have traveled through Belfast. His stated year of birth, determined from the census records, varies between 1786 and 1795, with a median of 1793; this also appears on his obituary. Most people in the 19th century remembered their birthday, but not their year of birth. Henry was early for an Irish Catholic emigrant. During the colonial era, America was not a welcoming place for Catholics. Despite William Penn's declaration of religious tolerance, and Roger Williams in Rhode Island, and Lord Baltimore, and the First Amendment, yadda, yadda, yadda, America in 1816 didn't like Catholics and didn't want much to do with them. Less than 1.2% of the population of the thirteen colonies was Catholic. Many Harbisons had passed through Philadelphia in the previous century, but they were Presbyterian to a man. Within a year of his arrival Henry left for Huntington County, in the south central part of the state, a valley in the Alleghenies. His obituary indicates he arrived there in 1816, shortly after his immigration. I'm still looking for evidence of what drew him to that place. None of his shipmates seem to have settled there. However, there is evidence it was more religiously tolerant than the eastern seaboard. Newry, one of the principal towns, was founded by Patrick Cassidy, a Catholic from Co. Down, in 1793. He was a surveyor, who also laid out Williamsburg, where Henry ultimately lived. And Henry's daughter Elizabeth married his grandson David. Huntington County wasn't quite the frontier, but it wan't far from it. Forty years previous, it had experienced Indian raids, during the War of Independence. Judging by the surnames, it was a polyglot place, with Pennsylvania Germans, WASPs, and Irish of both flavors. Henry doesn't appear in the 1820 US Census, but all that means is he was not a head of household, and was likely boarding with someone. He does appear in the Pennsylvania 1821 Census, for Woodberry Township, Huntington Co., listed as a joiner. At some time prior to that, probably 1818-1819, he had married Sarah Baugher, of Pennsylvania German origin (I'll justify this later). In 1820, he had the first of five children I can account for. Here they are. All of the kids are inferred from later census records. There may have been more, although 5 kids in 8 years was towards the upper end of reproduction rates at the time. The last child was born in 1827, and his wife Sarah died in 1832. That was the year the second great cholera pandemic came to the Unitewd States; it might conceivably also have carried off their younger children. The census of 1830 shows a fairly large household. In addition to his known kids, and his wife (20 - 30 years old), it enumerates three young men of ages 15-20 and one 20-30, and one extra infant boy, otherwise unaccounted for. I speculate these were hands he'd hired to clear a farm he'd bought (according to later records) that year. His farm was probably in excess of 100 acres, perhaps a quarter section. It was, reportedly rough ground, but he made it work, and by 1850 he was worth $11,200 in real estate, which is something around $400,000 in 2018 dollars. He was also a significant figure in his community. In 1838, he was elected constable of the county; in 1860, he served as vice president of the Democratic County Convention. In genealogy, one thing one learns is the real information is not in census records, marriage and birth certificates, but in wills and obituaries, where people expound on their families and what is important to them. In this respect, the will of Elizabeth Baugher, 1839, is a wonderful example. The great granddaughters, Henry's children, are unmistakable. It's not completely proven that Sarah was Sarah Baugher, but there's a Henry Baugher in the tax records of Woodberry for 1798 and 1800, and his enlistment records for the war of 1812; he signed up for the 5th Pennsylvania Volunteers (Coloner Fentons' regiment) in 1814. The regiment marched up to Pittsburgh anf then travelled by boat and foot along Lake Erie, to Buffalo, fighting in some substantial engagements. We don't know for sure what happened to Henry, but it seems likely he never came home, which would have left Sarah at least fatherless. Elizabeth appears in the 1830 census as aged between 70 and 80, which would put her birthdate 1750-1760; it's likely she was Pennsylvania German and originally named Bauer. The 1840 census is a mystery; because Henry isn't on it. US censuses until about 1880 are frustrating, because people were enumerated in no particular order; it was probably simply the order the census-taker got to them. But we can trace Henry's neighbors in 1830, 1840 and 1850, and he's definitely missing in 1840. My theory is he went back to Ireland to bring back some of his relatives, and his kids (the oldest was 20) were lodged with someone else. I'll go through this further anon. By 1850, all the children but Sarah were married. Henry himself was living as a widower in 1860, Sarah with him. He remarried in 1862, to a Juliet Rickert, widow of Henry Rickert, a Pennsylvania German from Lancaster County, PA. She was a music teacher, as was her widowed husband. 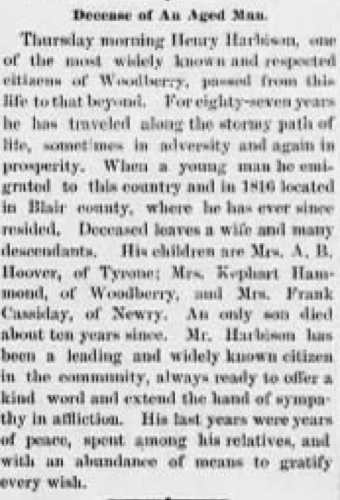 Henry lived on, evidently a pillar of society and frequently mentioned in the newspapers, until his death in 1880.